the blueberry bin | natural. healthy. whole. So it’s been a while since my last post (about a year and a half, actually) and I recently found myself being called back to blogging. Since I’m supposed to be a responsible, put together, adult-like person in less than a week, I guess I should be aware of the body I have and do it some good. So here we go, jumping back on the train. Sounds responsible, right? I seem to be losing all sense of time lately. I make long lists of things I need to do, which includes writing a post, but don’t seem to get much of it done. I’m not really sure where the hours in the day go, but it’s been a bit too fast for my taste. These past two weeks have been absolutely insane. I didn’t get to do anything but sleep (a little), go to class, workout, do homework, and study-study-study. This is the first time I have actually had a chance to even think about blogging. Have you ever had those moments where you sit down and can’t get up? Then you contemplate just sleeping in the chair you’re in? It’s that type of exhaustion that I am feeling right this moment. But this coming week is going to be so nice! No exams. No papers due. The weather is gorgeous. And I can get back to cooking real food again instead of scrounging around for whatever I can get my hands on quickly. It’s mostly been crackers and hard boiled eggs. Like I said, a hard couple of weeks. I am a stress eater. If I have anything mildly stressful in my near future I take it out on food. Not healthy, I know! At least I don’t keep anything too bad in my house…ice cream and chocolate: the worst offenders. I actually crave peanut butter (see my peanut butter addiction story) in vast amounts. Like I down a family size jar in three days. 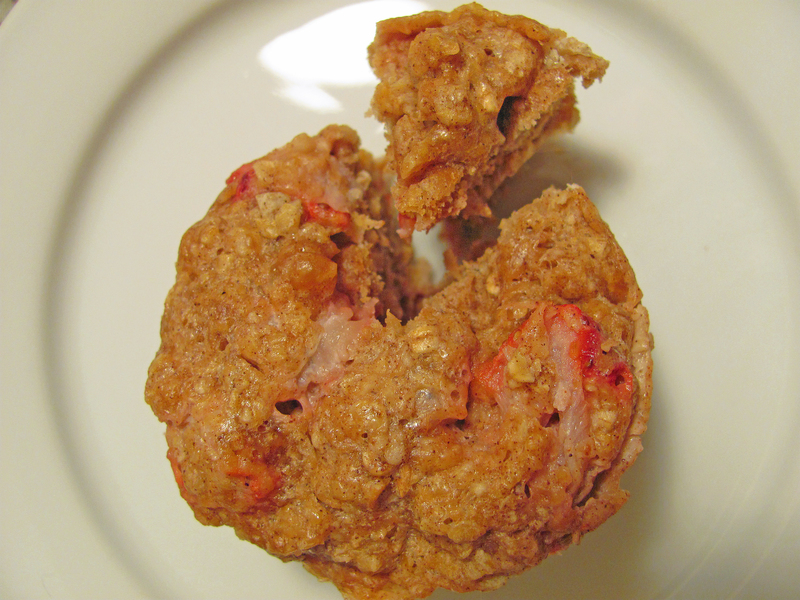 This little gem is similar to my Minute Magic Muffin but with a twist that incorporates peanut butter. of course. I know it’s Sunday and I should be posting a pancake recipe to my ‘Short-stack Sunday’ series, but my new pancake recipe didn’t exactly turn out as planned. It’s all about trial and error…this time was definitely the latter. But I mean it comes with the territory of making recipes; like my mom says “they can’t all be winners.” And I can’t possibly be upset about my failed pancake attempt with weather like this. Today feels like the first real day of Fall. HOORAY! If it could stay like this all through winter I would be one happy camper. Too bad it actually gets cold. It is absolutely gorgeous outside. Crisp, cool air. Clear blue skies as far as the eye can see. Birds chirping. Light breeze blowing. Sun shining. Today’s weather is the kind of day I define as a ‘perfect weather’ day. I just want to lay in the grass (like that meadow from Twilight…yeah, I went there) all day long and do absolutely nothing. With this weather comes my resurgence of pumpkin cravings. Pumpkin and fall go hand in hand, of course. Obviously a lot of other people agree because I went to the grocery store yesterday and there was pumpkin everywhere. Literally every direction I looked. It was insane…I was in heaven. This morning I walked onto my balcony, to water my little herb plants, and felt that magnificent fall weather. I knew at that moment that it was time to break out the pumpkin and create a delicious breakfast for this delicious day. Good thing I always have huge 48 ounce cans of pumpkin tucked away. 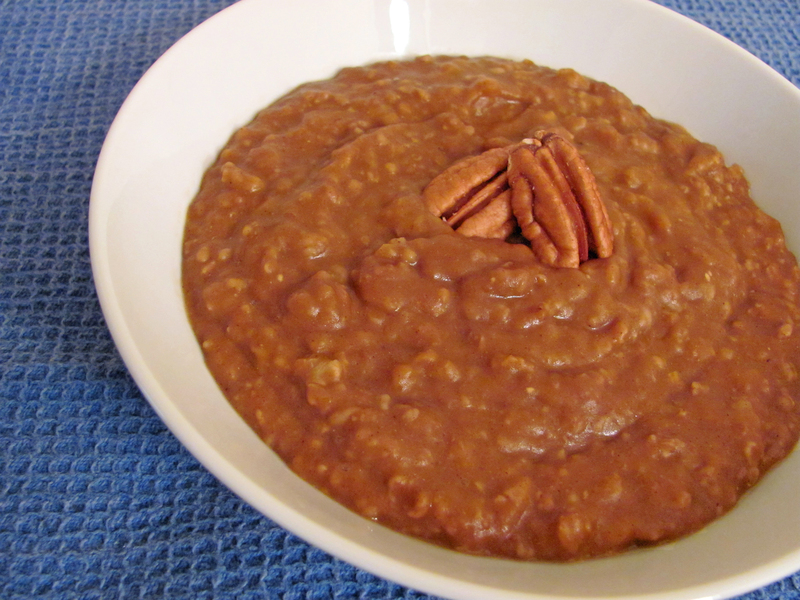 Introducing the stupendous Pumpkin spice latte oatmeal. It’s definitely at the top of my ‘Favorite breakfast’ list…I have a lot of lists. I am almost done with the chaos for the time being. And I was in serious need of a study break, so why not post? My brain is basically a mushy mass of unrelated, crazy thoughts. Don’t judge me. I love peanut butter. I eat it with everything. Apples, celery, popcorn, toast, crackers, bagels, oatmeal, pancakes, cookies, cereal, rice cakes, and (of course) on a spoon. Is it just me or is one spoonful just not enough? I can’t ever stop at one. I can stop at one chip, I can stop at one cookie, but I can never stop at one spoonful of peanut butter. Since I’ve gotten to school (which is now a little over a month) I have eaten three [and a half], yes THREE, family size jars of peanut butter. That may be a record. I’ll have to check on that. If you feel like it’s time for an intervention, I would not argue with you. Instead I would agree with you, sneak to my room, and take my peanut butter (that I’m hoarding) and run for it. I was craving peanut butter [surprise] but it was dinner time and I wouldn’t want to ruin my appetite now would I? So I combined my craving of peanut butter with dinner. This Thai Peanut Chicken is SO good and easy. The sauce is literally 4 (ish) ingredients and takes 2 minutes. 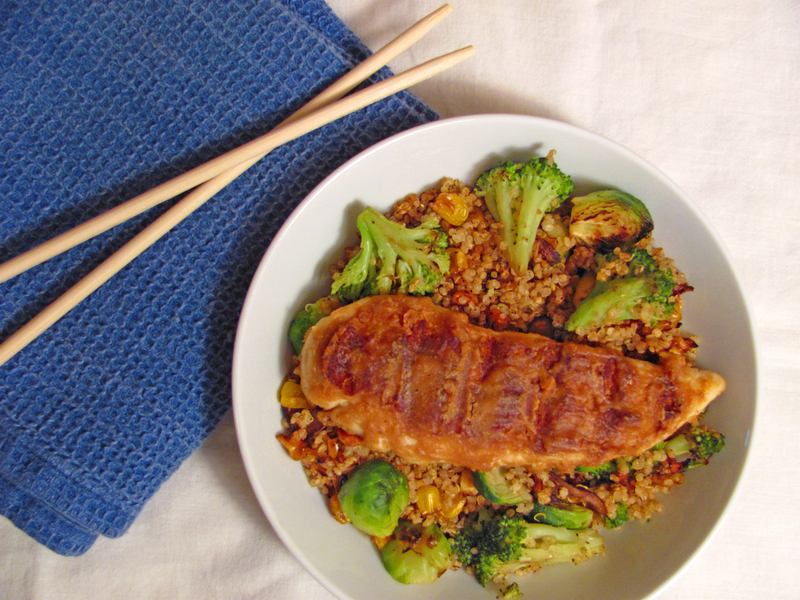 Pair it with my veggie fried quinoa and you have one tasty, hunger-quenching dinner. This is one of my favorite meals to make because it is ridiculously easy and it SO DARN DELICIOUS. You’ll just have to try it out and see for yourself! There is nothing quite like ending a happy/relaxing/lazy Sunday with a stack of fresh, hot, homemade pancakes. Since I started college (three years ago now..ohmygosh) I have made pancakes every weekend. And not for breakfast. 3) don’t have the time to make this feast before running out the door for work/school/errands. Solution? Brinner or dinfest. Breakfast4Dinner. Let’s break down the word. Pancakes: essentially cakes cooked flat in a pan; therefore, acceptable to eat as a meal. I am most certainly okay with that and let’s be honest..who doesn’t like pancakes?! My mom makes some mean (as in crazy delicious) pancakes. So I took her recipe and created a ton of variations. Wouldn’t want to have the same type of pancakes two weekends in a row, now would I? That would be preposterous. Through these weekends, (filled with a lot of trial and error) I have come up with quite a few pancake recipes that I will share with you as time goes on. So we will start the series off with…drum roll….Banana Bread Pancakes!!! I really love bananas. If you have been following my posts you will see that a lot (most) of my posts have something to do with bananas. They’re just so darn good, am I right or am I right? Especially home grown bananas. SO GOOD. Once you’ve had a home grown banana there’s no going back. One day my parents decided to plant a banana tree in our backyard. If you don’t know about how banana trees work I will inform you. Once the banana trees are all grown up, they start a stock of bananas. These stocks are HUGE. Then they ripen on the tree. You cut off the stock and you admire your cute little bananas and then devour them. [These bananas are about half the size of a ‘normal’ banana you see in the grocery store] That is the only stock that particular banana tree will make. It only makes one and then it dies. I know, it is sad. However, they pour down their little seedlings all over the ground and before you know it you have five banana trees in your backyard. For some reason, the trees decide to grow stocks and ripen all at the same time. Remember I said the stocks were huge? So, you have like 400 bananas that you have to try to mash/bake/eat/freeze/chip-ify, etc, before they rot. And now you understand why I have so many banana recipes…it was out of desperation! We didn’t have anymore room in our freezer and we were tired of dehydrating them. I totally made the inundation of bananas sound like a bad thing, but I actually love it a whole darn lot. I make smoothies, cupcakes, bread, chips, oatmeal, pancakes, muffins/mugfins, cake, dough, filling, ice cream, and use them as a topping. It’s an art. 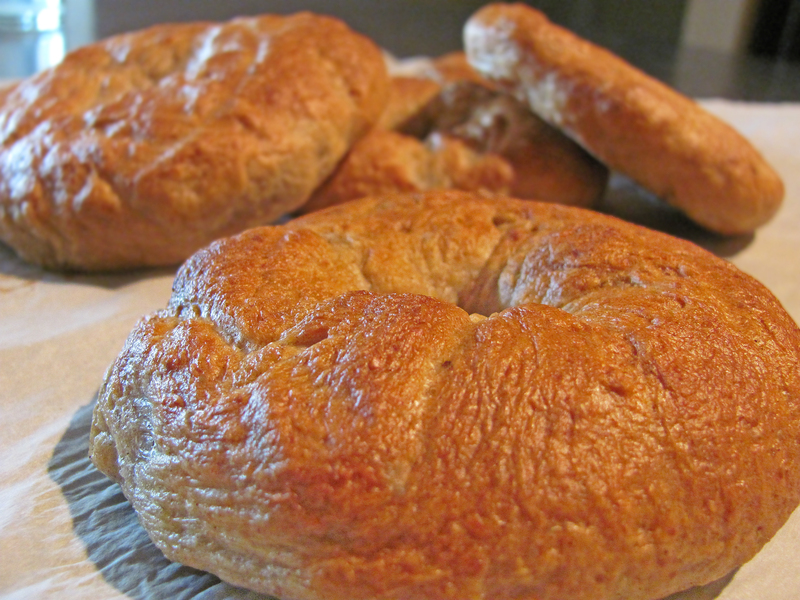 Soo now after that long introduction about bananas I present to you…..CINNAMON BANANA BAGELS! These bagels are slightly sweet, and not super banana-y. You could add more sugar if you want them to actually be sweet, but I like them just how they are. They smell heavenly. That’s thanks to cinnamon and banana combo. So I ride my bike to school everyday. I love to bike; it’s good for me, it’s faster than the bus or walking, and it’s super convenient. In my apartment complex we have bike racks to lock our bikes and I’ve never had a problem with it being outside. Well, this past weekend I didn’t use my bike. When I go to get on my bike to ride on to class, I swing my leg over and try to sit…and notice that my bike seat is MISSING. Missing you say? How is that possible? SOMEONE STOLE IT! Ugh. So I had to make reports to my apartment complex managers and the police. It baffles me that someone would just come up and steal a bike seat…like what? Apparently bike part/bike thefts are very common here. My dad was telling me that one of the national news stations did a series on bike thefts a couple of days ago. Ironic. He said that they put a GPS inside the bike and within the hour the bike was stolen, taken apart, and hidden in someone’s house. So maybe my bike seat is sitting in someone’s house waiting to be used again. I hope they enjoy it because it was a really nice, comfortable seat. Then came the hunting-for- bike-parts adventure. My silly bike (her name is Ethel) made it very difficult to find the right replacement parts, but my wonderful, detective mother found them! Anyway, after dealing with all of that, class, homework, meetings, and rehearsal all week, I’m tired. Therefore, I didn’t want to make anything for dinner that was too complicated, but really wanted something delicious. I looked in my freezer and saw that I had frozen butternut squash (pureed) and pasta in my cupboard. HAZA! A work of art was born. 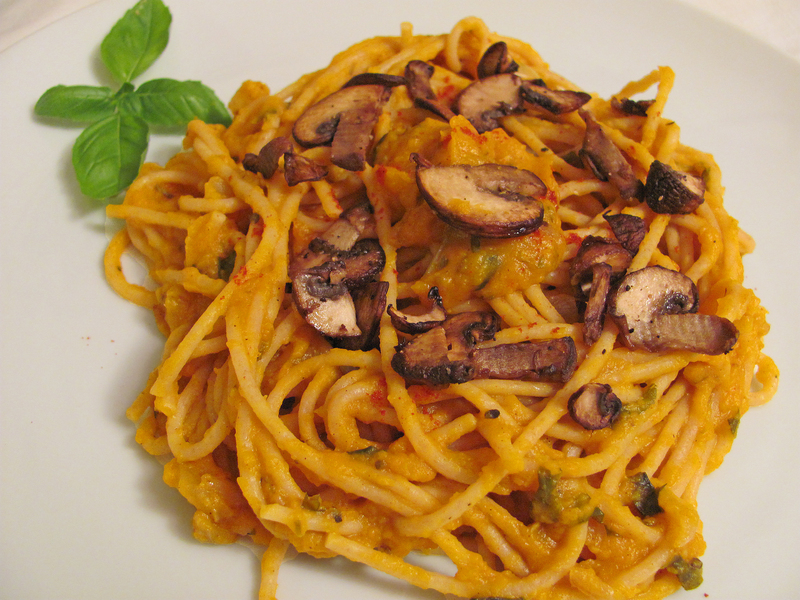 Introducing my Creamy Butternut Squash Sauce & Pasta: delicious, nutritious, and easy. It is sweet, thanks to the squash, and savory, thanks to the spices. It’s saucy [Don’t get saucy with me, Bearnaise!] and creamy and amazing. Enough yakking, lets eat. Sharing is caring! Click on a post, scroll to the bottom, and share as often as you’d like!